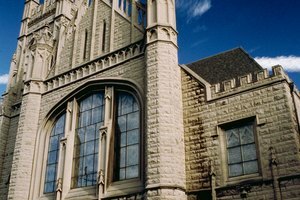 What Is the Meaning of Stained Glass? Many churches feature stained glass windows. "Stained glass" refers to glass that has been given a colorful tint. That is commonly accomplished by using a process that bakes pigment (or coloring substance) onto the surface of the glass. Stained glass is most often found in the decorative window displays of Christian churches of many denominations and is usually used to depict stories from the Old and New Testaments. Stained glass has been used throughout Christian history. Examples of stained glass have been discovered from the first century B.C. The Roman pieces are less works of art than examples of domestic luxury, and it was not until Christianity became the main religion of the Roman Empire that stained glass was used in places of worship. Since then, stained glass has become a staple of churches, especially in Europe, and many examples can be seen all over the world. Stained glass is part of a church's decoration. 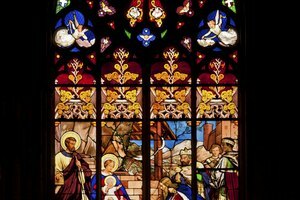 Stained glass windows usually depict moments from biblical history and range from very simple stained glass to more complicated examples of the art form. 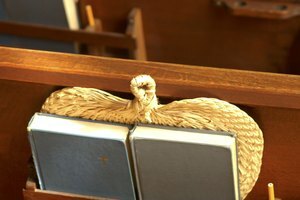 As primarily decorative parts of a church, they are common in Catholic churches and European Protestant churches, but they are more scarce in North American Protestant churches, which tend to favor more puritan places of worship. Most stained glass windows are not mass produced and tend to relate somehow to the individual churches they decorate. After the Reformation in the 16th century and the rise of Protestantism in Europe, many stained glass windows were destroyed, now making original examples quite rare. Some windows tell biblical stories. Many theories about the meaning of individual stained glass windows have developed over time, and the easiest way to work out what a stained glass window means is to learn when it was made. Some stained glass artists believed that all they did was provide a beautiful image to adorn a church, others saw themselves as creating visual sermons for churchgoers, while still others created visual riddles to be solved with biblical knowledge. Glass was made for different reasons in different periods. In the 12th century, stained glass windows were used to depict biblical individuals. In this case, the stained glass usually displays groups of people standing in lines or in buildings, each person holding something that hints at his identity. In the 13th to 14th centuries, stained glass artists began to focus on telling stories. Many windows from this period are part of a sequence that tells the greater story. From the 15th to 17th centuries, stained glass windows were used to create moralizing images. These windows do not tell a story as much as depict a moral. Stained glass windows can depict religious figures. 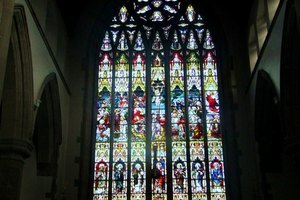 Stained glass windows usually depict saints and biblical stories connected to the church in which they are displayed. Many sequences also depict the Nativity and Easter stories and more well-known biblical figures such as King David, King Solomon, Christ, Mary and the disciples. They are usually intended for churchgoers to contemplate and think about the stories and figures they see and to consider how the lessons learned from them can be applied to everyday life. Kennard, Alexander. "What Is the Meaning of Stained Glass?" 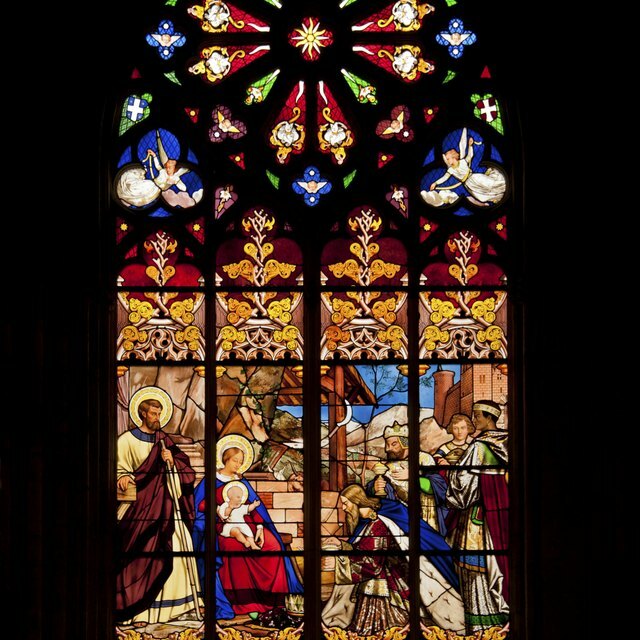 Synonym, https://classroom.synonym.com/what-is-the-meaning-of-stained-glass-12080927.html. 29 September 2017. 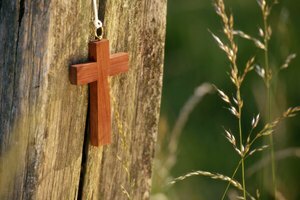 Why Do Protestants Not Have Jesus on the Cross?